Mariah Carey performs at the 82nd annual Rockefeller Christmas Tree Lighting Ceremony at Rockefeller Center on December 3, 2014 in New York City. (CNN) -- Mariah Carey is known for her five-octave voice, her slinky dresses and her many hits, including "All I Want for Christmas is You." Unfortunately, she is also known for her tardiness. And her behavior this week at the Rockefeller Christmas Tree Lighting Ceremony in New York won't do anything to help that reputation. Because of her history, NBC decided to tape Carey singing her holiday classic before a live audience Tuesday night, then air it Wednesday for the network's coverage of the 82nd annual Rockefeller Center tree lighting. But the self-titled Queen of Christmas kept the audience waiting for three hours Tuesday before NBC made the decision to cancel the performance. According to TMZ, Carey was delayed because she was meeting with her lawyer about her divorce settlement with husband Nick Cannon. Carey took to Twitter to apologize for failing to show up. Last night's situation was beyond my control. I apologize to all that showed up, you know that I would never want to disappoint you. But some fans were already annoyed. "#Mariah Carey was nicknamed "Mirage" in high school because she never showed up for class." Her no-show forced NBC to air Carey singing "All I Want for Christmas is You" live during its broadcast of the tree-lighting Wednesday night. The diva was on time, but many observers are saying her performance was less than stellar. Decked out in a tight red gown before a backdrop of costumed children, Carey seemed winded and had trouble hitting some of her trademark high notes. A clip of Carey's raw microphone feed, without backing instrumentation, also was leaked to YouTube -- and probably did not do her any favors. Twitter lit up during and after, with most of the tweets admonishing the singer for a lackluster performance. Still, some fans rallied to her side. "So, was #mariahcarey 's Rockefeller performance perfect? No. Was it good? Yes! Do you know how cold it is out there???" said one. 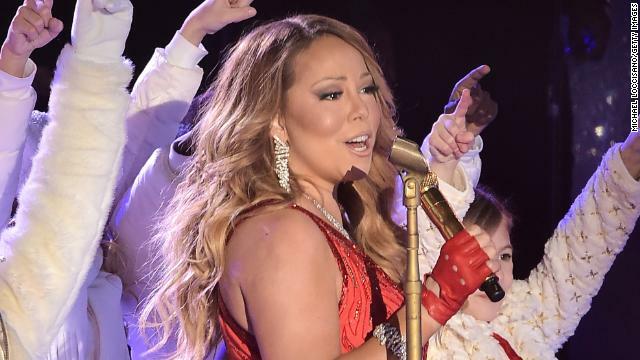 So, was #mariahcarey 's Rockefeller performance perfect? No. Was it good? Yes! Do you know how cold it is out there?? ?